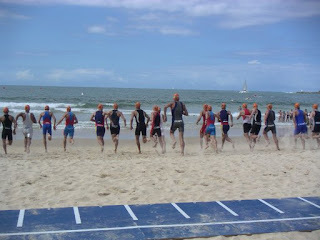 Having semi-prepared for it, Ross and I went to Mooloolaba for an Olympic distance triathlon! That’s 1.5k swim, 40k bike, 10k run. 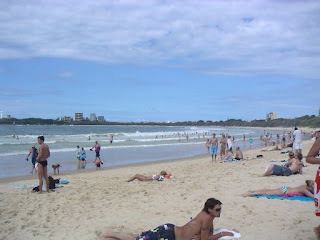 Mooloolaba is on the Sunshine Coast in Australia about an hour’s drive north of Brisbane. And what a beautiful place it is! The temperature was about 27C the whole time we were there and it doesn’t cool off much at night so you can sleep with the windows wide open. There are huge white beaches with impressive surf and the water temperature was about 24C! So no wetsuit for the triathlon. 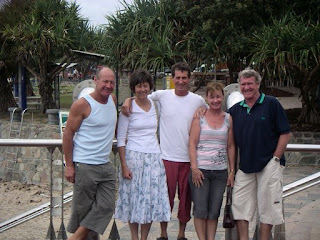 We stayed in an apartment right on the water with Ross’ friend Paddy from Warwick. Friday and Saturday we ran, swam and biked a little and ate a lot! Paddy’s brother and son also did the triathlon and his sister and her husband plus another son came to watch so we had a great cheering section and lots of people to go out for dinner with. On Saturday, I noticed that there were a series of buoys placed some distance out from the buoys they had set up for the swim course. I asked Ross what they were and he said: shark nets!! It freaked me out a little but I guess I should have just been happy that they put them out. Fortunately, I didn’t think about sharks once during the race. Here’s a photo of where the swim course was. We ran out into the surf, swam parallel to shore out past the breakers and then swam back in. The triathlon was on Sunday and my wave took off at 6:51am. Fortunately New Zealand is 2 hours later than Queensland at this time of year so it wasn’t too hard to get up at 4. Actually we got up at 5 and barelygot out of the transition area in time because the program said that daylight savings ended in Australia that morning. But they neglected to say that they don’t observe Daylight Savings in Queensland at all so the clocks didn’t change! There were a lot of panicking triathletes trying to get ready in about 2 minutes as a result. The day was perfect. The surf had been huge the two days before but it was much better on Sunday. And it wasn’t very windy so the bike was fun. They actually closed the main motorway for the race, if you can believe it! So we biked out to the motorway and then did most of the bike portion on an empty highway! It was hot on the run but then some clouds came up, which helped a lot. I enjoyed most of the race except for the first hot part of the run. Despite going easy on the swim and the bike so I’d have something left for the run, I still had to walk up part of one hill. But I did about as well as I deserved given how much I had trained for the race! I was in a new age group because they went by your age at the end of the year. But it appears that only the really good triathletes are still competing by the time they get to my age group. I only managed to beat one person! I would have beat 6 in my old age group. Ross had a great race. He started 8 minutes after I did and caught up to me at the start of the run. Then he just rocketed and finished 12 minutes before I did (20 minutes faster over all). Paddy was less then a minute behind Ross. At their last triathlon, they were only 12 seconds apart! So now we are inspired to really get in shape for next season. The New Zealand nationals are this weekend in Wellington but 6 days between races is a little too short so we’re going to give them a pass. There was also a World Cup pro race the same day. That was great fun to watch. There were racers from Australia, NZ, USA, Canada, Japan, Spain, Portugal, China and several other countries. So it was a very competitive field. 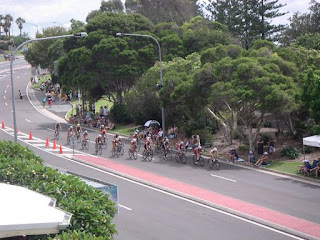 In the men’s race, an Aussie passed a guy from Spain at the very end, much to the local crowd’s delight.